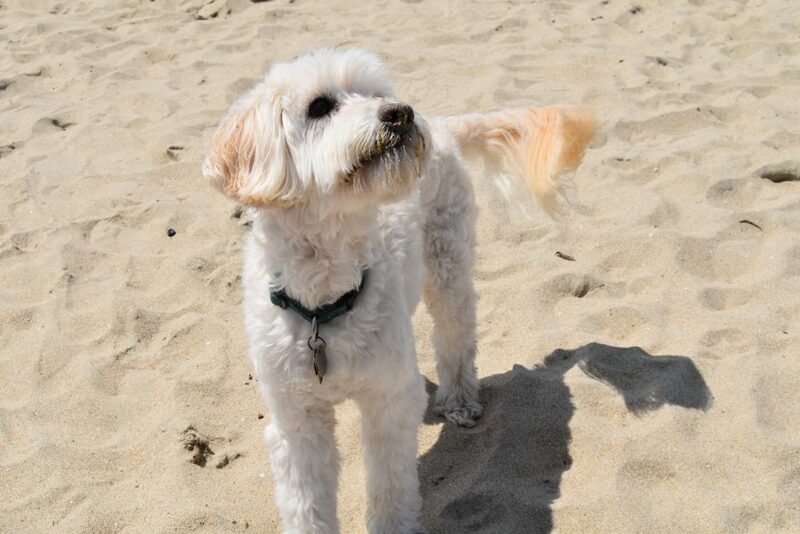 We recently took a SoCal Day Trip to Rosie’s Dog Beach and Open Sesame. Our boy Jackson really needed a fun trip outside of the house after a week of not feeling well. 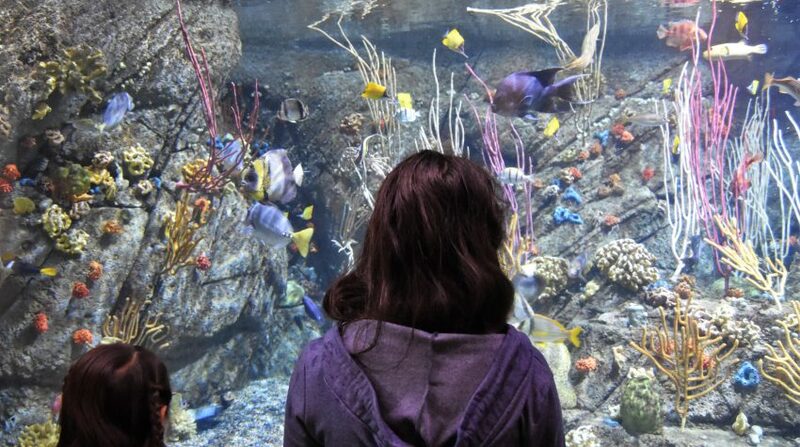 The family wanted to enjoy an outing where all family members could participate, and this one did not disappoint! 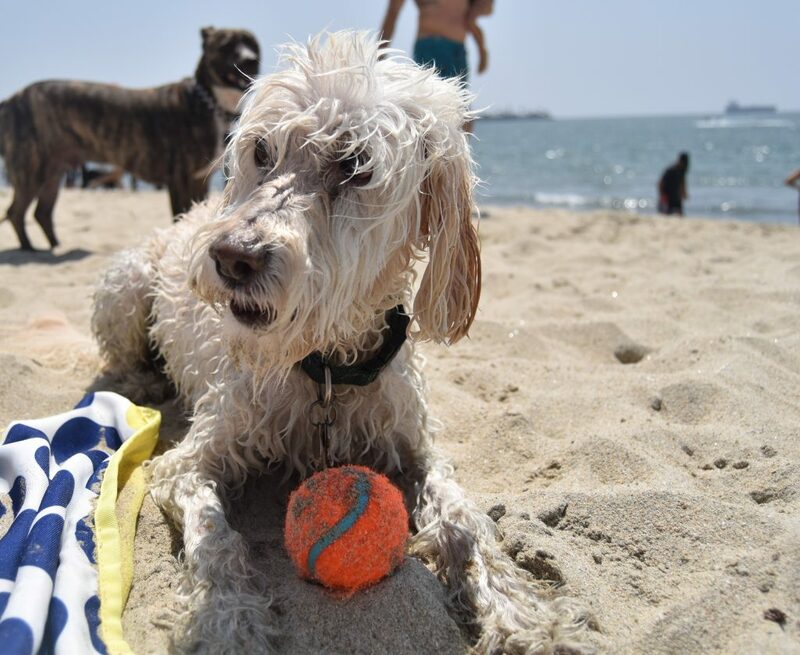 Be sure to read our tips for visiting Rosie’s Dog Beach at the end of this post! Disclosure: This post contains affiliate ads. This site might receive a commission from purchases made through these links. 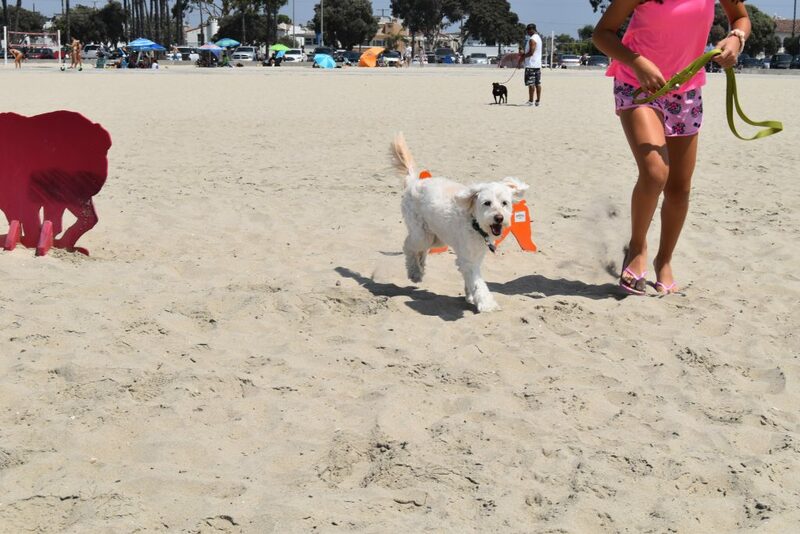 Rosie’s Dog Beach is a 4 acre beach located in the Belmont Shore area of Long Beach, California. You’ll find the beach on Ocean Avenue, between Granada Avenue and Roycroft Avenue. The beach is open from 6 a.m. to 8 p.m. If you bring more than one dog, make sure that there is one adult present for every dog. We took our SoCal Day Trip to Rosie’s Beach on a Sunday and found that there was plenty of parking. If you are lucky, you can find free parking on the street. However, there is also a parking lot with meter parking that is right off of the sand. We parked in the Granada Lot and were happy to find that we could pay with a card. Mr. Jackson has been to the beach before and appeared to recognize the smell of ocean air pretty immediately! He was yanking on his leash to be let go as soon as his paws touched sand. However, we couldn’t let him go until we had reached the designated border for the dog beach. Dogs are only allowed to be in the designated dog zone and beach paths. Either Jackson’s eyesight is not so good, or he’s just being a dog. After Jackson’s questionable stop, he ran straight to the ocean. There are a lot of dogs running around, so don’t be surprised when you throw a ball and your dog is not the one to retrieve it. Sometimes half of the fun is watching a rascal dog keep the ball away from your dog so that they will play with them. This dog kept running circles around Jackson trying to make a new buddy. We were shocked to look toward the ocean and find that there were not one, but two people swimming along the shoreline with their dogs! This was a new one for us! These dogs were wearing life vests and were just happily swimming along right next to their person. Check out the video here! I honestly think the life vest is a great idea if you are going bring your dog to the beach often and are worried about their swimming ability. While there, we also found that a dog was hungry and looking for some food. He was sticking his snout into unzipped cooler bags while his person yelled at him to stop. 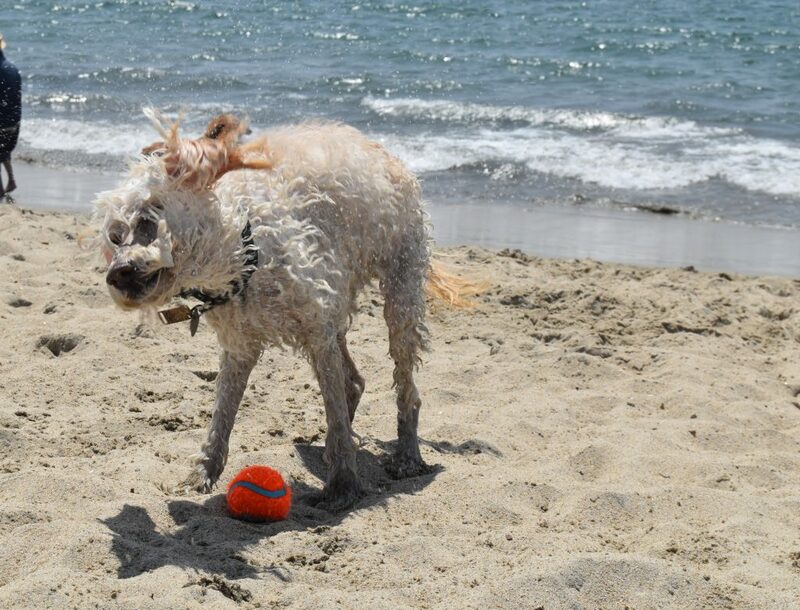 It was pretty hilarious, but also taught me to make sure to bring closed containers to the dog beach. Even though it was hot outside, we noticed that Jackson started shaking after jumping in the ocean water a few times. We realized that he was getting cold with the ocean breeze and decided it was time to go. Everyone was starving after the dog beach. 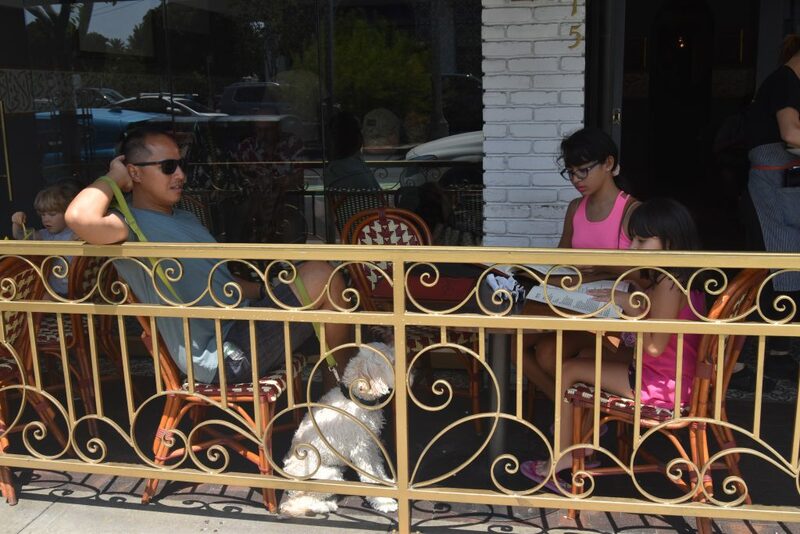 We headed over to Belmont Shore where there are plenty of dog-friendly restaurants with patio seating. 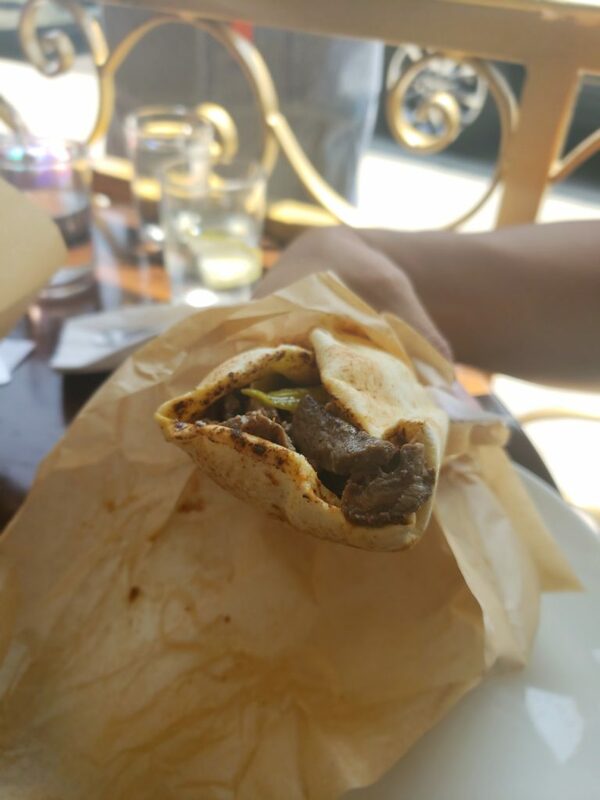 We stopped in at one of my favorite restaurants: Open Sesame. This is mediterranean style food. Jackson got to sit outside on the patio with us as we enjoyed the fresh air. We were happy that Jackson could join us at the restaurant. 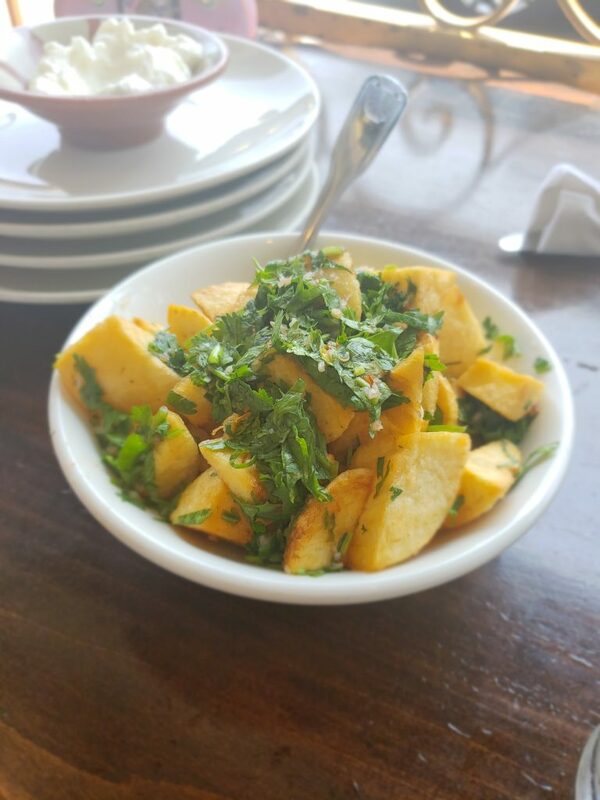 We ordered the fried potato appetizer, which is a popular item on the menu. It has lemon juice, garlic, and cilantro- three of my household’s favorite flavors. If you go to Open Sesame, you must try it. 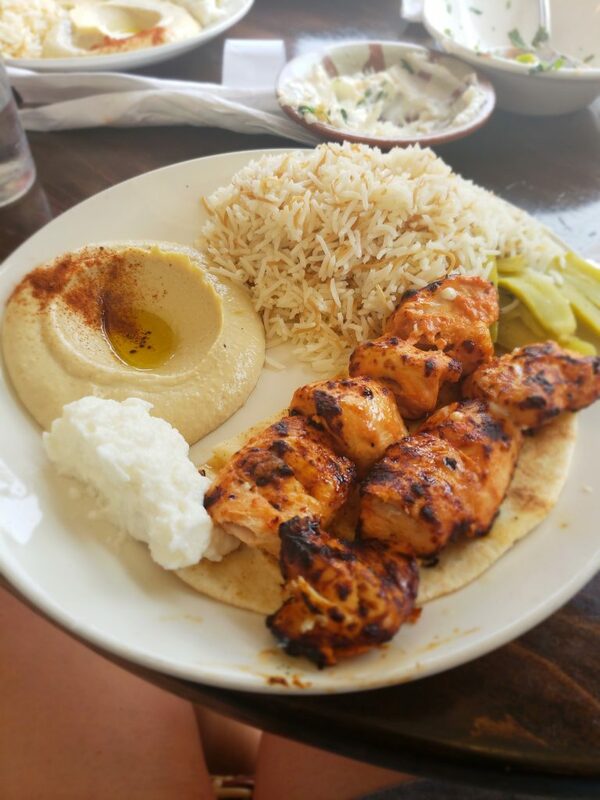 My kids and I love the Chicken Tawook plate and split two of them among the three of us. Their dad ordered the Beef Shawarma and said it was excellent. If you’re wondering, Jackson had the chicken we were unable to finish, along with some pita bread. Check out my boy eating like a gentleman here! The waitress was kind enough to bring him a disposable container with water. I told you they were dog-friendly! 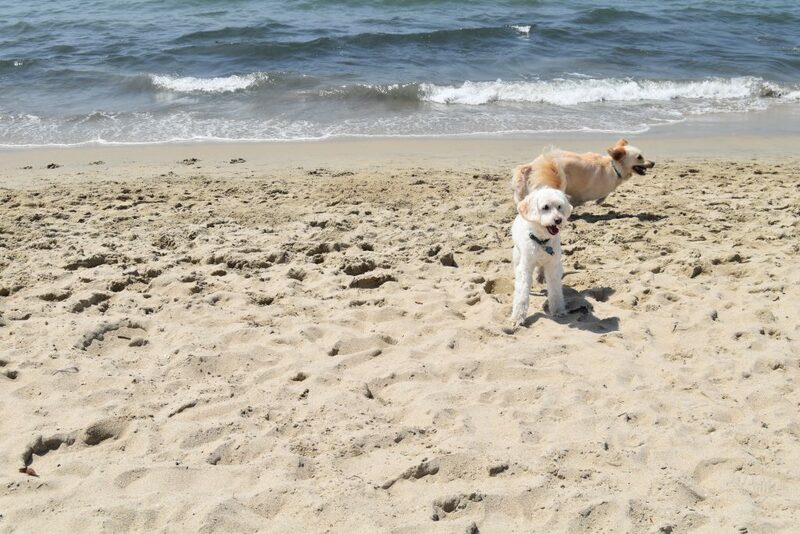 Age and health: Only licensed, fully-vaccinated dogs 4 months old and older are allowed at Rosie’s Dog Beach. 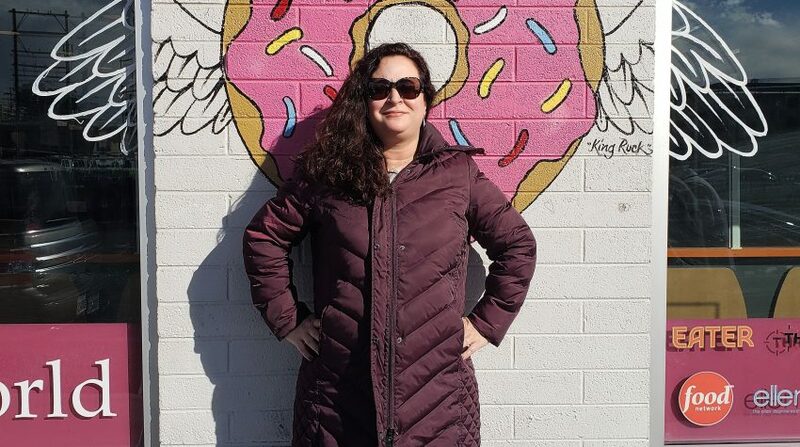 Go at home: There are bathrooms, but the hubby said they are pretty gross inside. I recommend you try to avoid using them. Hold that leash! :Don’t take the leash off of your dog until you are at the clearly marked space for Rosie’s Dog Beach. There are dog shaped metal cutouts in a line that delineate the border of the dog beach. Don’t let your dog off leash until you have reached that boundary. Take at least 2 towels: One towel so that you can dry your dog when they get wet. The other towel for your dog to sit on when you get back in the car. Consider a life vest: If you’re worried about your dog going far into the ocean and are not sure that he/she can swim very well, you can buy a life vest for your dog. I saw quite a few dogs with life vests in the water at Rosie’s Dog Beach. Put your food in closed containers: There was a dog trying to get into another person’s food bag when they were away from their spot. They left their bag unzipped…and you can imagine what happened. Take a tall chair: (i.e.-camping chair) if you want to be a little higher than the dogs. We sat on a blanket and had plenty of dogs coming over for a pet. We were fine and loved it. However, if you are worried about another dog getting up in your face for a pet (and they will! ), you’ll want a seat that is higher off of the ground. Take an umbrella, hat, and sunblock: We forgot 2 out of 3 and it was a little painful after a while! Take water for everyone: Make sure your dog has a container they can drink water from. As you can imagine, a bunch of sand gets in their mouths as they play ball and run around the beach. Dress appropriately: Wear something that you don’t mind getting wet. You might wind up having to jump into the water even if you don’t want to do so. We once saw an owner have to jump into the ocean because their dog wouldn’t stop swimming! Of course, there’s also the issue of dogs shaking out every time they get wet. Don’t take aggressive dogs: Make sure that your dog is friendly around other dogs and people. This is an absolute must! You are legally liable if your dog causes injuries at Rosie’s Dog Beach. Take flip flops with you: I have not had a problem with this yet, but since you are on a dog beach…you want to avoid stepping in any surprises if you know what I mean. Most owners are very respectful and pick up after their dogs. However, sometimes the dogs can be pretty sneaky about going to the bathroom when their owner is not looking. 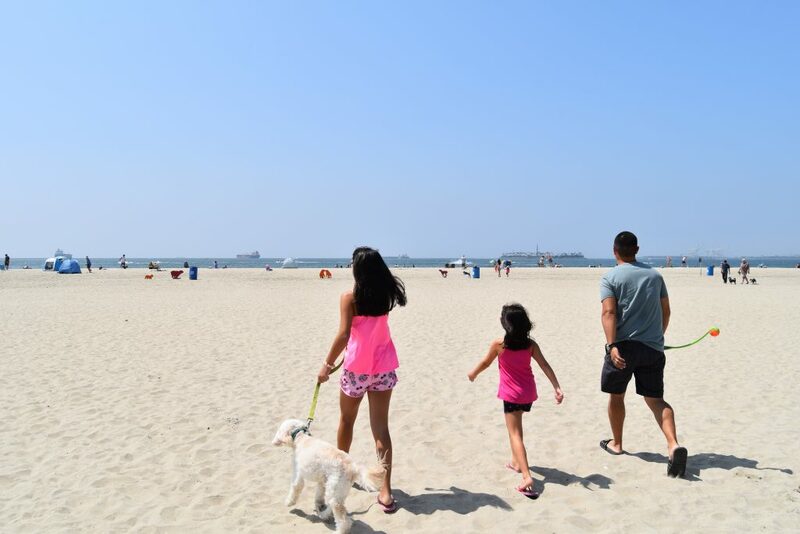 If you want another dog-friendly SoCal Day Trip idea, take a look at our post about Huntington Dog Beach here. Sounds wonderful I’ve never taken my dog to be beach. Didn’t know they had them. Thank ASOCALwayoflife. You should give it a try 🙂 Thanks for reading! 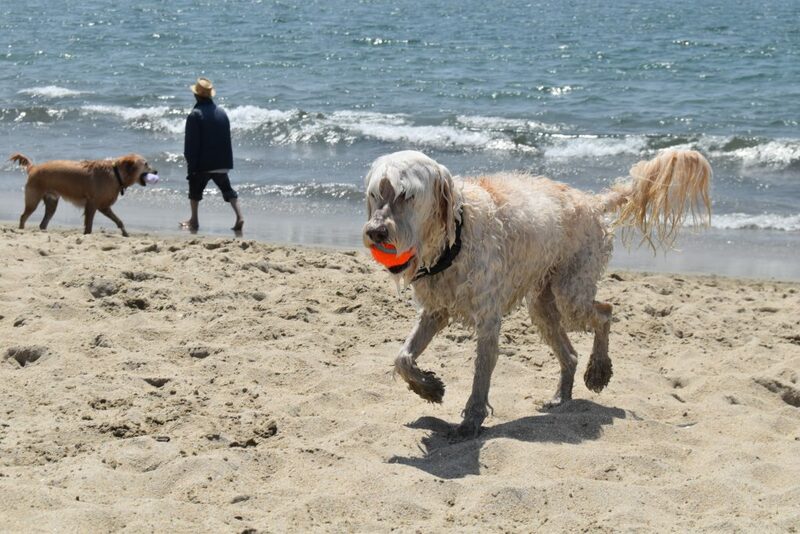 Love Belmont Shore but did not know about this dog Beach. Yes! Belmont Shore has a lot of hidden gems.